Home cooking needs well stuffed kitchen with elegant and high-quality cookware to make it interesting. Kitchen tools made from real 18/10 stainless steel are for that reason highly recommendable. Excelsteel 7-Piece Stainless Steel Cookware With Encapsulated Base is a perfect example of what home chefs need for preparation of a great meal. Apart from giving your home kitchen a 5-star look, this cookware is designed to make food preparation easy and hygienic. The stainless steel finish prevents the surfaces from reacting with food substances for worry-free cleaning and maintenance. The Excelsteel 7 Piece Stainless Steel Cookware set is constructed to provide durable and cost-effective kitchen service.With a large pan and three different-sized pots with lids, this cookware set is convenient for any kitchen. This provides an appealing appearance. The Excelsteel 7 Piece Stainless Steel Cookware set is very easy to clean, but might require some soaking if there are materials that have been caked into them in order to achieve the best look. 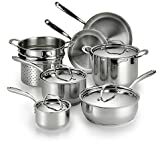 The set is ideal for a starter kitchen since they are few and easy to maintain. The handles of the pots are welded to reduce the amount of heat that is transferred from the pan to the hands. This ensures that no burns are experienced making it very comfortable to hold when pouring. You do not require using pot holders since the steel does not get too hot unless it has been on the stove for a long period of time. The base is designed to allow even distribution of heat when preparing different meals. The heat is evenly distributed from the bottom of the cookware.You do not have to push the pans to ensure that the bottom gets heated. The lids enable you to monitor the progress of the food when cooking to achieve the best results. They fit perfectly to provide a better seal. The steam vents allow excess steam to escape reducing the amount of pressure when preparing various dishes. It has 1-quart saucepan with lid; 2-quart saucepan with lid; 5-inch fry pan and 5-quart Dutch oven with lid. Excelsteel 7 Piece Stainless Steel Cookware set is perfect for an independent person starting a kitchen because the pieces are relatively few. They are created of quality materials for long-term use and cooking of delicious meals. Q: Has anyone experienced any flaking or peeling? A: No, I clean my set using steel wool, and I have not experienced any peeling for the last two years. I love the quality of the cookware. Q: I can see the photo has four pieces. Can somebody give me a list of what 7 pieces are included? A: This is where many people get confused. The set has four pans and three lids, which make a total of seven pieces. Q: Can I use the set on portable induction cooktop? A: Yes, it can be used. I use mine, and it performs well. Your kitchen will always be as delight as thecooking with this cookware set. It is available for an affordable price to suit any home chef with a fixed budget. 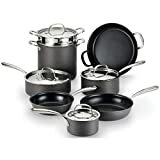 In case you are looking for a reliable cookware set for your new kitchen, this 7-piece will perfectly serve you.